Gene Autry Centennial Scully Shirt Ladies' "Thunderbird"
This Scully shirt is inspired by one of Gene Autry's beautifully embroidered personal appearance shirts from the 1940s and 1950s, which are now in the Autry National Center's permanent collection. 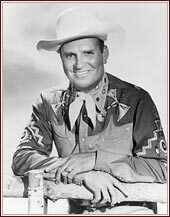 If you live by Gene Autry's Cowboy Code, you can now look the part in a shirt made especially to celebrate the Gene Autry Centennial. Also available in Mens' sizes.